Evidence has suggested resveratrol has multiple biological effects, including anti-oxidative, antiinflammatory and anti-carcinogenic properties. The neuroprotective role of resveratrol has been recently reported in animal models of neurodegenerative disease including Parkinson’s disease and Alzheimer’s disease. However, the mechanism remains unclear. Here we present our results of resveratrol’s therapeutic effect in improving the cognition of rats with brain impaired by carotid artery stenosis. Morris water maze experiment exhibited that treatment with resveratrol can markedly recover the memory and learning ability of the rats, confirming the neuroprotective function of resveratrol. We also demonstrated that the expression of three key proteins in the rat hippocampus cholinergic system, ChAT, AChE and Vacht, was greatly reduced under carotid artery stenosis condition, but after treatment with resveratrol the expression of all three was significantly enhanced. We further showed that the mRNA levels of these 3 proteins in the rat hippocampus were dramatically reduced by carotid artery stenosis, but were significantly increased by resveratrol application. These results demonstrated that resveratrol’s neuroprotective function is probably through the cholinergic system, and suggest resveratrol can be a potential drug target for Alzheimer’s disease. Resveratrol, Parkinson’s disease, Alzheimer’s disease. Resveratrol is a polyphenolic compound and phytoalexin, which is largely found in the skin of grapes and red berries, as well as in several types of nut. Since it was first reported in 1939 , it has drawn much attention due to its multiple biological effects and so on. The neuroprotective role of resveratrol has been recently reported in the numerous animal models, including cerebral ischemia , kainic acid induced excitotoxicity , and Parkinson’s disease . In case of resveratrol, polyphenol has been identified as playing a very important role in the neuroprotection in cases of models of neurodegeneration like Parkinson’s, Alzheimer's, or Huntington's disease, brain and spinal cord injury or ischemia. The resveratrol has some neuroprotective effects owing to the activity of antioxidants that are associated with the stilbene structure and with two phenol rings. These give it the ability to scavenge different free radicals, which include carbon-centered radicals, lipid peroxyl and Reactive Oxygen Species (ROS). Aside from this it also is capable of upregulating the expression of various antioxidant enzymes . Alzheimer’s disease (AD) is a neurodegenerative disease, which lead to dementia and affects people's physical and mental health seriously . The cholinergic system is closely associated with memory and attention and the loss of cholinergic neurons takes place in the AD patient’s brain appears to be a very important factor contributing to AD memory deficit . In the cholinergic system, Acetylcholine (ACh) is widely distributed in the peripheral and central nervous systems. In the cytoplasm, ACh is synthesized by the reaction of acetyl-CoA and choline in the presence of the enzyme Choline Acetyltransferase (ChAT) and released into the extracellular in form of vesicular. Following depolarization, ACh undergoes exocytosis reaching the synaptic cleft, where it can bind its receptors, including muscarinic and nicotinic receptors. The reductions of these cortical cholinergic markers and levels of acetylcholine are association with cholinergic hypofunction with cognitive deficits, which led to the formulation of the cholinergic hypothesis of memory dysfunction in senescence and in Alzheimer’s disease. Therefore, targeting the Cholinergic System has been an important strategy in looking for treatment for Alzheimer’s disease . Literature shows that resveratrol, which is a polyphenol (trans-3, 4’, 5-trihydroxystilbene) that occurs naturally imposes all its beneficial effects on AD, which in turn is a neurodegenerative condition which is age related and in certain cases is comorbid containing some metabolic disorders like obesity and type 2 diabetes. Resveratrol mimics caloric restriction which is made possible by an extension of the lifespan of various small organisms, and also by the delay of certain age related phenotypes like abnormal glucose metabolism. It is believed that resveratrol can influence cognitive deterioration beneficially. Several clinical studies are being conducted in order to explore the different benefits of resveratrol in treating individuals diagnosed with dementia, especially those who are characterized by a Mild Cognitive Impairment (MCI), which is a clinical condition that further progresses to a condition of AD . The direct molecular targets of resveratrol and its direct molecular targets in both in vitro as well as in vivo, not known. This compound has been proved to have modulated cellular processes by the process of activating the key metabolic sensor or the effector proteins, which includes Sirtuin 1 (SIRT1), AMP-activated protein kinase (AMPK), and peroxisome proliferator-activated receptor γ co-activator-1α (PGC-1α). In the beginning the proposal was to ensure that resveratrol makes a binding in vitro to SIRT1 and also activates the activity of deacetylase of this enzyme. Resveratrol has beneficial effects in the in vitro models of Alzheimer's Disease (AD), epilepsy, Parkinson's Disease (PD), Amyotrophic Lateral Sclerosis (ALS), Huntington’s Disease (HD) and nerve injury. SIRT1, AMPK and PGC-1α were all believed to be part of these neurological disorders and their etiology. Recently resveratrol has been reported to have potential for treating Alzheimer's disease [9,10], but the mechanism remained unclear. Here, we present our results of resveratrol’s therapeutic effect in improving the cognition of rats with brain impaired by carotid artery stenosis. We also demonstrate that resveratrol can improve the protein expression and mRNA level of three key important proteins in rat cholinergic system, which indicates resveratrol’s neuroprotective function is probably through the cholinergic system and hence resveratrol can be a new target for Alzheimer's disease. Li et al. made a presentation on the Chronic Cerebral Hypoperfusion (CCH) which is not only one of the prime causes of Vascular Dementia (VaD) but it is also an etiological factor relating to AD. However, a therapy which is most effective for both these diseases is yet to be found. Resveratrol is nothing but a polyphenol that is produced by plants which is proven to have many biological functions which are a delay in the onset of these age related diseases and thereby an increase in the lifespan. A supplement containing resveratrol is capable of exerting neuroprotection against many factors of injury which induce neuronal death as well as degeneration and finally lead to a cognitive decline in the CCH rat model. For evaluating the learning and memory, a Morris water maze was made use of. Electrophysiological recording was utilized for the detection of synaptic plasticity, the western blot was the one that was helpful in the detection of protein levels and finally Golgi staining was applied to examine any dendritic spinal change. Kaur et al. made an investigation of aprepitant and its effects, which is a substance P-NK1 receptor antagonist in Bilateral Carotid Artery Occlusion (BCCAO)-induced vascular dementia and ischaemic brain injury. This Bilateral carotid artery occlusion was completed and performed in rats known as Wistar rats for the purpose of producing ischaemic injury and hypoperfusion. Aprepitant and donepezil (positive control) and aprepitant were both administered to the rats. This took place from day 28 and went on to day 42 after BCCAO. Donepezil (2 mg/kg) and aprepitant (20 and 40 mg/kg) showed a significant improvement in the vascular function and the capacity to learn and keep in memory and also showed a notable decrease in the oxidative stress, death of neuronal cells and pain in the BCCAO rats. The effect of donepezil was much more significant in comparison to the lower dose of aprepitant on the disease markers. On the other hand, BADGE (30 mg/kg a, PPAR-antagonist) ensured that the highly ameliorative effect of aprepitant was prevented. There was yet another rat model that was presented by Zhang et al. which was successfully used for the purpose of exploring the mechanisms of Paeoniflorn (PF). The Neuron- Specific Enolase (NSE), the Bcl-2 associated X protein, S100β, B-Cell Lymphoma 2 (Bcl-2), the Brain-Derived Neurotrophic Factor (BDNF) common in the hippocampus and cytochrome c and their levels of expression were measured by making use of western blot analysis. The results of this analysis proved that by administering PF for a continuous period of 28 days can lead to a very noticeable decrease in both NSE and S100β levels, both of which are very sensitive markers for damage to brain, in rats belonging to the VaD model. Additionally, PF also inhibited the process of initiating apoptotic cell death and also ensured the attenuation of the now low expression levels of the BDNF which is induced commonly by an artery occlusion which is bilateral and present in carotid artery. Therefore, it is confirmed through these data that the neuroprotective effects that PF and VaD may have as well as throw light on the usage of PF as a possible treatment if cognitive impairment is detected in early stages. Another investigation was conducted by Wang et al. which was about the Nuclear factor erythroid 2-related factor 2 (Nrf2) and its effects on acupuncture and vascular dementia. Nissl staining and Morris water maze were both used for the purpose of assessing the effect that acupuncture may have on cognitive function as well as on hippocampal neurodegeneration while experimenting vascular dementia. Nrf2 is distributed in neurons which are again in hippocampus. Nrf2 in cytosol as well as in nucleus, its protein expression and the mRNA levels and protein levels of its downstream targeted genes which are NQO1 and HO-1 were identified by Western blotting, Double immunofluorescent staining, and realtime PCR analysis. Cognitive function and the activation of microglia and its cognitive function were both measured in Nrf2 gene knockout mice and wild-type mice after their treatment using acupuncture. Resveratrol (≥ 99% pure) in the form of red crystals was obtained from Sigma Chemical Company (USA). It was stored at 277 K before use. Resveratrol was administered with 0.5% (w/v) Stroke-physiological saline solution, and a dose of 20 mL/kg per day was used. Male Sprague Dawley rats (weighing 280-300 g) were obtained from the Experimental Animal Center of Shandong Luye Pharmaceutical Co., Ltd (Yantai, China). Rats were kept a controlled light room with a 12 h light/dark cycle, at a constant temperature of 22 ± 2°C and humidity of 55 ± 5%, and allowed free access to food and water. All animal experiments were approved by the guidelines of Institute for Laboratory Animal Research of Shandong Provincial Hospital Affiliated to Shandong University and were in strict accordance with US National Institutes of Health Guide for the Care and Use of Laboratory Animals . A total of 30 male SD rats were included in the experiment. These 30 rats were randomly selected and divided into 3 groups, each with 10 rats, as follows: sham operation group (Sham), Model group (Model) and treatment group (Tau). Rats in Sham group were subjected to sham surgery. In the Model group (Model), the rats underwent carotid artery stenosis modeling surgery; and the rats in Tau group underwent carotid artery stenosis modeling surgery and were treated with resveratrol. Morris water maze test: The spatial learning and memory performance of the rats were assessed via MWM testing which consisted of a circular water tank (2 m diameter and 1.5 m high) filled with water (25 ± 1°C). Animals were tested for place-learning acquisition with the escape platform (5 cm diameter) located in the middle of the southeast quadrant, 3.5 cm below water surface. Training was performed four times daily for 5 consecutive days. The rats were trained to swim randomly from each of the four starting positions while facing the wall, and allowing them to swim freely until they found the platform. The rats were given 2 minutes to find the platform and to remain on it for 15 s. The rats were guided to the platform and left there for 15 s if failing to find the platform within 2 minutes. To evaluate the rat’s spatial retention ability, on the 6 day, the platform was removed and allowing each rat to swim freely for 2 min inside the pool. The total swimming distance travelled and the swimming distance in the target quadrant for 2 min were recorded by the tracking system. AChE and ChAT activity measurement: After Morris water maze tests, the rats were euthanized by an overdose of intraperitoneal pentobarbital. The brain of each rat was immediately removed, and the hippocampus was isolated. All brain tissues were stored at 80°C for biochemical analysis. The rat hippocampus was prepared by dispersion through a Terumo IOO-pl syringe in at least 20 volumes of 0.32 M sucrose containing 0.5% Triton X-100. Choline Acetyltransferase (ChAT) was estimated by the method of Fonnum  generally carried out in the presence and absence of 2X M bromoacetylcholine, a selective inhibitor of choline, but not carnitine acetyltransferase . Homogenate protein levels were estimated by the Lowry et al. . The results expressed as U/g (enzymatic unit per gram protein). Acetylcholinesterase (AChE) activity was determined according to Ellman et al. , with some modifications. Hydrolysis rates were measured at acetylthiocholine concentration of 0.8 mM in 1 ml assay solutions with 30 mM phosphate buffer, pH 7.5, and 1.0 mM DTNB at 25°C. About 50 μl of rat hippocampus supernatant was added to the reaction mixture and pre-incubated for 3 min. The hydrolysis was monitored by formation of the thiolate dianion of DTNB at 412 nm for 2-3 min (intervals of 30 s). All samples were run in duplicate. The protein was measured by the method of Lowry et al. using bovine serum albumin as standard. The results were expressed as U/mg (enzymatic unit per milligram protein). Rat brain tissue lysates were fractionated by sodium dodecyl sulfate polyacrylamide gel electrophoresis (SDS-PAGE) and detected by immunoblotting using goat polyclonal antibodies (Cell Signaling Technology, Beverly, MA, USA) react with rat ChAT, AChE, Vacht, respectively. GAPDH was used as a control to determine the sample loading size and also to validate the experiment settings. The blots were visualized by G: BOX Gel and Blot Imaging Systems (Syngene, Cambridge, England). Rat brain tissue lysates were harvested and washed with Phosphate Buffered Saline (PBS). Total RNA (2 μg) was extracted using ISOGEN (Nippon Gene, Tokyo, Japan) and was subjected to RT-PCR using a SuperScript One-Step RTPCR kit (Invitrogen, California, USA). For RT-PCR analysis, cDNA was synthesized using FastQuant RT Kit (with gDNase) (TIANGEN, Beijing, China) according to the manufacturer's instructions. The gene-specific primer pairs used are shown in Table 1. PCR amplification was carried out for 38 cycles (denaturation for 60 s at 94°C, followed by primer annealing for 90 s at 55°C, and extension for 120 s at 72°C). Expression levels of ChAT, AChE and Vacht mRNA were measured by Roche Lightcycler 480 (Roche, Nutley, NJ, USA) using SuperRealPreMix Plus (SYBR Green, TIANGEN) following default procedures. GAPDH was used as a loading control. Table 1: Primers used in RT-PCR. Statistical analysis was performed with the program SPSS statistical software, version 19.0 (IBM Corp., Armonk, NY). Data were expressed as the mean ± standard deviation (SD). Single data points were presented in some graphs. Statistical analyses were performed using one way Analysis of Variance (ANOVA) followed by two tailed student t-test (T-test) with equal variances assumption. Statistical significance was assumed at P<0.05. Resveratrol shortens the escape latency in rats with cognition impaired by carotid artery stenosis. The rats in the Sham group showed continued shortening of Escape Latency, indicating unaffected learning ability in this group. In the Model group, the Escape Latency did not show a continued shortening pattern, and it is much higher than that in the Sham group (Figure 1). In the Tau group, which was treated with resveratrol, the same pattern as in the Sham group was observed that the Escape Latency continued to drop along the days of training. Although the escape latency in Tau group is still higher than that in the Sham group, compared to the Model group, it is greatly reduced, indicating resveratrol can recover part of the learning ability (Figure 1). 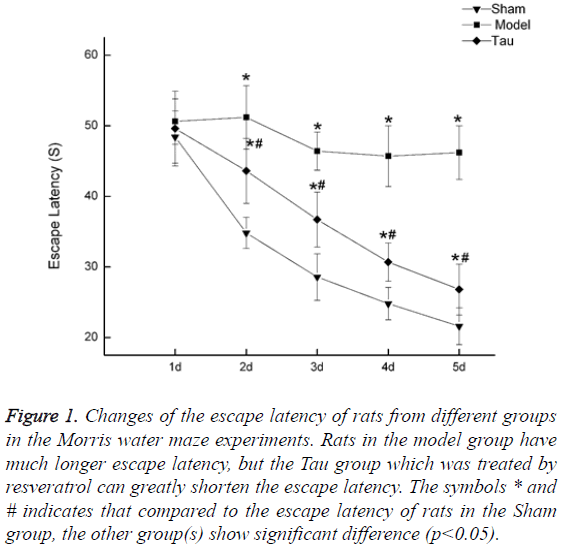 Figure 1: Changes of the escape latency of rats from different groups in the Morris water maze experiments. Rats in the model group have much longer escape latency, but the Tau group which was treated by resveratrol can greatly shorten the escape latency. The symbols * and # indicates that compared to the escape latency of rats in the Sham group, the other group(s) show significant difference (p<0.05). Resveratrol increased the memory of rats with cognition impaired by carotid artery stenosis. To investigate the memory of rats in these three groups, we performed 3 measures: 1) how many times rat crossed the platform; 2) how much time the rat retained near the platform; 3) the escape distance to reach the platform. The results were summarized in Table 2. Rats in the Model group, showed consistent results in the three measures to demonstrate the memory loss due to carotid artery stenosis condition, that they had both lowered Times crossing the platform and time retaining near the platform, and an increased escape distance to reach the platform. In the Tau group, which was treated with resveratrol, the rats showed some recovered memory, that their measures were between the Sham group and the Model group. These results indicate that resveratrol can recover, at least partially, the memory loss caused by carotid artery stenosis. *, #Indicate the difference is significant compared to that in the Sham group. Table 2: Comparison of learning and memory of rats from different groups. Resveratrol improves the activity of AChE and ChAT. To investigate the influence of resveratrol on the cholinergic system, we measured the enzymatic activity of two key proteins in the cholinergic system: AChE and ChAT (Table 3). In the Sham group rats, the activity of AChE was 0.68 ± 0.04 U/mg protein, but in the Model group, the activity of AChE was reduced to 0.36 ± 0.05 U/mg protein. With resveratrol treatment, the rat in the Tau group has increased AChE activity (0.49 ± 0.02 U/mg protein). Similar results were observed for ChAT activity, that in the Sham group, the activity is 165.53 ± 1.95 U/mg protein, which is much higher than that in the Model group, 105.74 ± 2.64. The treatment with resveratrol can increase the activity of ChAT to 136.82 ± 2.45 U/mg protein. Table 3: Activity of AChE and ChAT in the hippocampus of rats from different groups. Resveratrol increased the protein expression level of AChE, ChAT and Vacht in rat hippocampus. 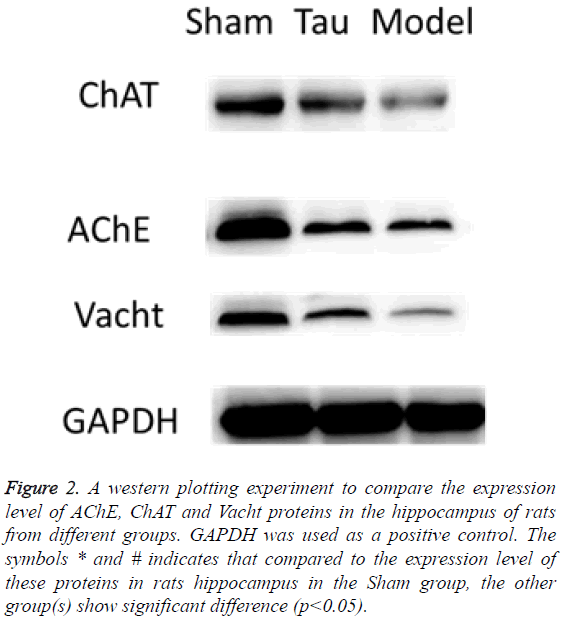 By using western blot, we measured the protein expression level of AChE, ChaAT and Vacht in the rat hippocampus. In the Model group rats, the expression of all these proteins were greatly reduced, indicating the brain impairment by carotid artery stenosis reduced these proteins’ production. In the Tau group, which were treated with resveratrol, the expression level of all these 3 proteins were increased compared to the Model group, although none of them was as high as in the Shan group (Figure 2). These results indicate that the resveratrol can influence the expression of these proteins, through which it can function on the cognition. Figure 2: A western plotting experiment to compare the expression level of AChE, ChAT and Vacht proteins in the hippocampus of rats from different groups. GAPDH was used as a positive control. The symbols * and # indicates that compared to the expression level of these proteins in rats hippocampus in the Sham group, the other group(s) show significant difference (p<0.05). Resveratrol upregulates the expression of mRNA of AChE, ChAt and Vacht in rat hippocampus. We also invested the mRNA express level of AChE, ChaAT and Vacht in the rat hippocampus by RT-PCR, and the results were shown in Figure 3. Clearly, compared with the Sham group, the mRNA level of all these 3 genes in the rats of the Model group was greatly lowered. With resveratrol treatment, which is the Tau group, the mRNA of all these 3 genes were increased, though still lower than the levels in the Sham group. 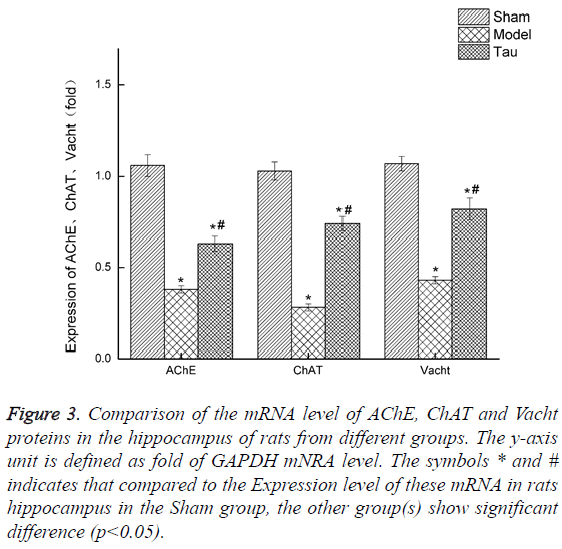 Figure 3: Comparison of the mRNA level of AChE, ChAT and Vacht proteins in the hippocampus of rats from different groups. The y-axis unit is defined as fold of GAPDH mNRA level. The symbols * and # indicates that compared to the Expression level of these mRNA in rats hippocampus in the Sham group, the other group(s) show significant difference (p<0.05). The present study demonstrated that resveratrol was able to improve the cognition of rats whose brain was damaged by the carotid artery stenosis. These findings demonstrated the neuroprotective function of resveratrol under condition of carotid artery stenosis, and pinpoint to its high value in practical clinical usage to treat brain damage and/or cognition impairment. On the other hand, people would wonder besides the cure effect, if resveratrol also have the presentative effects on brain damage events. This would be of more value in practical clinics because some damage happened to the brain cannot be reserved, even partially. So it would be very interesting to investigate the experiment to give resveratrol before the animal carotid artery stenosis modeling and evaluate its preventative effect. This is certainly something valuable to explore and is under our future research plan. We also demonstrated that resveratrol can improve the protein expression as well as mRNA level of three key important proteins in the cholinergic system, namely AChE, ChAT and Vacht. The interaction of resveratrol with some host proteins has also been reported in other areas. Evidence showed that resveratrol could suppressed memory disorder in the vascular dementia rat model, and reversed the changes in the expression levels of Bax, cleaved caspase 3 and cleaved PARP and Bcl 2, which were induced by vascular dementia. All these finding suggest that resveratrol can interact with some host proteins directly which thereafter initiate cellular signals to regulate mRNA and protein expression of key proteins in various systems, to recover the damage in brain and neuron systems. Therefore, identifying these host proteins and looking further into the interactions of resveratrol with these proteins with structural biology and biophysics methods is of significant clinical value. The cholinergic system plays a crucial role in memory and learning ability and the loss of cholinergic neurons takes place in the AD patient’s brain appears to be a very important factor contributing to AD memory deficit. There are only four drugs that have been approved for treating AD patients so far, including the cholinesterase inhibitors-donepezil, galantamine, and rivastigmine, etc. However, the current treatments for AD patients provide only symptomatic relief and are not very efficient. Thus, a novel approach for AD treatment needs to be explored. A possible approach to treat AD patients could be drugs targeting CHT1, since choline uptake by cholinergic neurons is the rate-limiting step for ACh production. It has been shown that changes in the expression, trafficking or activity of CHT1 could directly affect choline uptake and, consequently, cholinergic neurotransmission [20,21]. A good strategy to increase choline reuptake, and thus ACh synthesis, could be through increasing neuronal firing, which consequently could increase CHT1 relocation to the plasma membrane [22-24]. Thus, drugs that could increase cholinergic neuronal firing, perhaps by acting on ion channels that regulate neurotransmitter release, have the potential to increase CHT1 plasma membrane expression and, as a result, ACh synthesis. In fact, it has been shown that APP interacts with CHT1 proteins increasing their endocytosis from the cell surface  and that mice that display disruption of CHT1 gene expression exhibit symptoms related to ACh deficit . Therefore, drugs capable of increasing CHT1 at the cell surface hold potential as future therapy for AD. Our finding that resveratrol can improve the cognition of cognition impaired rats through the cholinergic system, suggesting resveratrol and its analog can be potential new drug targets for treating AD. Takaoka M. Resveratrol, a new phenolic compound from Veratrum grandiflorum. Nippon Kagaku Kaishi 1939; 60: 1090-1100. Li Z, Pang L, Fang F. Resveratrol attenuates brain damage in a rat model of focal cerebral ischemia via up regulation of hippocampal Bcl 2. Brain Res 2012; 1450: 116-124. Wu Z, Xu Q, Zhang L, Kong D, Ma R. Protective effect of resveratrol against kainate-induced temporal lobe epilepsy in rats. Neurochem Res 2009; 34: 1393-1400. Khan MM, Ahmad A, Ishrat T. Resveratrol attenuates 6.hydroxydopamine.induced oxidative damage and dopamine depletion in rat model of Parkinsons disease. Brain Res 2010; 1328: 139-151. Arteaga O, Revuelta M, Uriguen L, Alvarez A, Montalvo H, Hilario E. Pretreatment with resveratrol prevents neuronal injury and cognitive deficits induced by perinatal hypoxia-ischemia in rats. PloS One 2015; 10: 0142424. Qiu C, Kivipelto M, von Strauss E. Epidemiology of Alzheimers disease: occurrence, determinants, and strategies toward intervention. Dialog Clin Neurosci 2009; 11: 111-128. Ferreira-Vieira TH, Guimaraes IM, Silva FR, Ribeiro FM. Alzheimers disease: Targeting the Cholinergic System. Curr Neuropharmacol 2016; 14: 101-115. Pasinetti GM, Wang J, Ho L, Zhao W, Dubner L. Roles of resveratrol and other grape-derived polyphenols in Alzheimers disease prevention and treatment. Biochimica Et Biophysica Acta (BBA) Mol Bas Dis 2015; 1852: 1202-1208. Li F, Gong Q, Dong H, Shi J. Resveratrol, a neuroprotective supplement for Alzheimers disease. Curr Pharm Des 2012; 18: 27-33. Ma T, Tan MS, Yu JT, Tan L. Resveratrol as a therapeutic agent for Alzheimers disease. Biomed Res Int 2014; 2014: 350516. Li H, Wang J, Wang P, Rao Y, Chen L. Resveratrol reverses the synaptic plasticity deficits in a chronic cerebral hypoperfusion rat model. J Stroke Cerebrovasc Dis 2016; 25: 122-128. Kaur J, Sharma S, Sandhu M, Sharma S. Neurokinin-1 receptor inhibition reverses ischaemic brain injury and dementia in bilateral common carotid artery occluded rats: possible mechanisms. Inflammopharmacology 2016; 24: 133-143. Zhang Y, Wang LL, Wu Y, Wang N, Wang SM, Zhang B, Zhang SC. Paeoniflorin attenuates hippocampal damage in a rat model of vascular dementia. Exp Therap Med 2016; 12: 3729-3734. Wang XR, Shi GX, Yang JW, Yan CQ, Lin LT, Du SQ, Liu CZ. Acupuncture ameliorates cognitive impairment and hippocampus neuronal loss in experimental vascular dementia through Nrf2-mediated antioxidant response. Free Rad Biol Med 2015; 89: 1077-1084. The Ministry of Science and Technology of the Peoples Republic of China. Guidance Suggestions for the Care and Use of Laboratory Animals 2006. Fonnum F. A rapid radiochemical method for the determination of choline acetyltransferase. J Neurochem 1975; 24: 407-409. Tucek S. The synthesis of acetylcholine in skeletal muscles of the rat. J Physiol 1982; 322: 53-69. Lowry OH, Rosebrough NJ, Farr AL, Randall RJ. Protein measurement with the Folin phenol reagent. J Biol Chem 1951; 193: 265-275. Ellman GL, Courtney KD, Andres V. A new and rapid colorimetric determination of acetylcholinesterase activity. Biochem Pharmacol 1961; 7: 88-95. Haga T. Synthesis and release of (14C)acetylcholine in synaptosomes. J Neurochem 1971; 18: 781-798. Kuhar MJ, Murrin LC. Sodium-dependent, high affinity choline uptake. J Neurochem 1978; 30: 15-21. Ferguson SM, Savchenko V, Apparsundaram S, Zwick M, Wright J, Heilman CJ, Yi H, Levey AI, Blakely RD. Vesicular localization and activity-dependent trafficking of presynaptic choline transporters. J Neurosci 2003; 23: 9697-9709. Ribeiro FM, Alves-Silva J, Volknandt W, Martins-Silva C, Mahmud H, Wilhelm A, Gomez MV, Rylett RJ, Ferguson SS, Prado VF, Prado MA. The hemicholinium-3 sensitive high affinity choline transporter is internalized by clathrin-mediated endocytosis and is present in endosomes and synaptic vesicles. J Neurochem 2003; 87: 136-146. Ribeiro FM, Black SA, Cregan SP, Prado VF, Prado MA, Rylett RJ, Ferguson SS. Constitutive high-affinity choline transporter endocytosis is determined by a carboxyl-terminal tail dileucine motif. J Neurochem 2005; 94: 86-96. Wang B, Yang L, Wang Z, Zheng H. Amyolid precursor protein mediates presynaptic localization and activity of the highaffinity choline transporter. Proc Natl Acad Sci USA 2007; 104: 14140-14145. Ferguson SM, Bazalakova M, Savchenko V, Tapia JC, Wright J, Blakely RD. Lethal impairment of cholinergic neurotransmission in hemicholinium-3-sensitive choline transporter knockout mice. Proc Natl Acad Sci USA 2004; 101: 8762-8767.